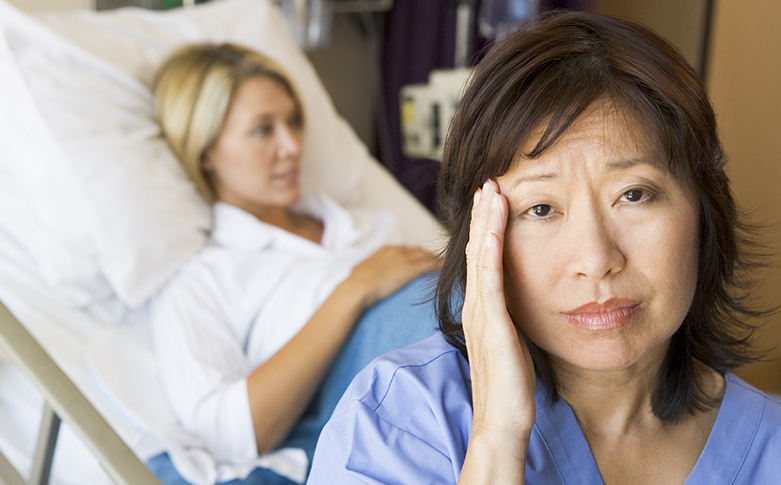 Nurses hear it all: The good, the bad, and the (very, very!) ugly. From pushy patients to bossy doctors, nurses handle it all with grace. But there are some things that can get under the most tolerant nurse’s skin. NursingLink talked to healthcare professionals, one another and (of course!) nurses to find out what phrases or questions were most irritating. Ever felt like strangling someone with your stethoscope? Then you probably heard one of these 10 things. You’re not an object to be fawned over. You’re saving lives here! You don’t have time to be ogled. Luckily, younger generations probably have never heard the phrase, so you can hope that it will be phased out soon. Okay. We get it. We’ve all seen the cartoons with the buxom nurse who is swooned over by a wolf, or a man, or an Animaniacs character. It wasn’t funny or original the first dozen times you heard it, and it certainly hasn’t made a positive impact 10 years later. Puh-lease. Anyone who has actually spent any time around a doctor knows that dating one is next to impossible. Crazy hours. Constant stress. Big egos. Who wants to put up with that? Plus, everyone knows you shouldn’t “dip your pen in the company ink.” Spending 12-plus hours with someone can make you form an incredibly close bond, but that doesn’t mean your coworkers will make the best significant others. Anyone who asks a nurse this is clearly watching too much Grey’s Anatomy and needs their head examined. What were we just saying about people who watch too much Grey’s Anatomy? While medical shows are a great form of entertainment – tons of nurses watch them, too – that doesn’t mean they are an accurate portrayal of when hospital life is like. Nursing organizations have even taken up arms against nurse-centered shows like Nurse Jackie and HawthoRNe. Prior to these shows, nurses were almost never the focus of a medical TV show. Nurses were merely in the background emptying bedpans or taking orders. But we know the truth. Nurses are the foundation of any good health system. They don’t have time to be the center of attention because they are always cleaning up a (metaphorical) mess a doctor has left! Nurses work alongside other nurses. They report to other nurses. They belong to organizations and unions just for nurses. Edie Falco of Nurse Jackie put it perfectly when she said “Doctors diagnose. Nurses save lives.” When it comes down to it, nurses are the ones in the trenches. Because they spend the most time with patients, they can be counted on to know when something is wrong or if a patient has made any progress. Doctors and nurses may work side-by-side, but nurses are responsible for nurses. Patients depend on nurses to keep their healthcare experience a positive one. But we all know that things can get hectic in the medical field. Emergencies and unpredictable accidents can happen on a daily basis which means patients may not always be seen when they thought they would. Having a patient gripe at you and ask “What’s taking so long? !” can be irritating, especially if you are trying your hardest to make sure everyone is taken care of. It’s in stressful situations like this that it’s sometimes easier to snap instead of calmly explain that you are doing your best.